Coming up with a good business name can be quite difficult at times. There are lots of factors to be considered. Seriously, no laughing while eating. Don’t play play! Lol! Mana boleh macam nih??? it’s remind me of a show previously shown in NTV7 – Jangan Ketawa hosted by Afdlin Shauki. Shhhh…these days, have to be careful when saying anything about restaurants. Later, can get sued… Tsk! Tsk! very eye catchy indeed.. so everyone inside must be eating seriously.. LOL..
Jangan Ketawa but boleh senyum kambing tak? Like stp’s komen..so if we laugh while eating can get sued? 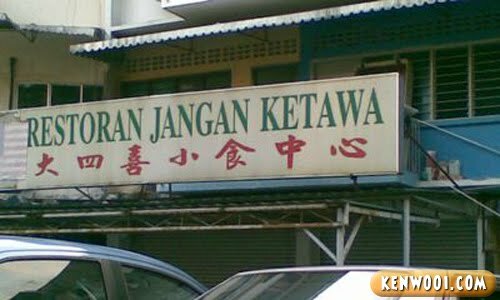 there’s a restaurant called Restoran Tepi Sungai in Perak. Guess where the restaurant is located next to. a hair saloon name also damn fail. It’s called Crazy Cut but reads “simply cut” in Chinese. LOL! hahahaha..maybe the name was inspired by the comedy show – jangan ketawa..remember? lol…… I do hope the food is good……. or maybe it’s bad that’s why they request us not to laugh.. where is it situated? Ja-ja-jangan ketawa! Can’t help but be reminded of the comedy series. Oh my, how have the years passed! Im sure you’ll laugh loudly when you are there.